I think the title is pretty much self-explanatory. Today I will touch this topic as we live now already for more than a year in Germany after living for nearly eight years in Finland. The years in Finland were surely exciting and we had no urge to move anywhere to soon however few months before Nathan was born we made from one day to another the decision to move to Germany. Then in 2014 our son was born, shortly after that we got our apartment in my old hometown and planned the whole moving process which took the whole summer. More about what happened in 2014 can be found in this summary I wrote in the end of last year. All the things which will be listed here are from our own experiences and can (and will!) vary as it always depends on the person plus the area where you live in/ surroundings. The first thing which comes to my mind is the nature. Finland got an amazing nature even in the cities. You got those huge forests, thousands of lakes, the Baltic sea, part of the country is even within the Arctic Circle and so clean air. Sure, Germany also got many beautiful things to offer but all in all it just can’t keep up with Finland when you are used to wild forests just behind your building while as in Germany you got to travel some longer distances to enjoy some real nature. Just thinking about my parents cottage in Finland makes me want to book a ticket and fly asap there though on second thought I might postpone that to next summer to enjoy the never setting sun and some warmer temperatures than now. So which country do we prefer when it comes nature? Finland of course! The next point on this list is a very important one, the living costs! While living in Finland all those years we surely felt that live wasn’t cheap there but we never realized just how expensive everything is until we moved to Germany and needed to do our first grocery shopping. Just unbelievable, in average everything was suddenly only half price than what we were used to in Finland and some little things such as garlic, ginger etc up to only 1/10 of the Finnish prices. Through this we are already able to spend half the money per months than what we had to in Finland! You might think that in Finland you must earn more in order to sustain higher prices but the average income is only slightly higher than in Germany (speaking out of our own experiences and what we heard from friends). Germany is the clear winner when thinking about living costs and any other costs such as for clothes, anything you wish to buy or just going out to eat! 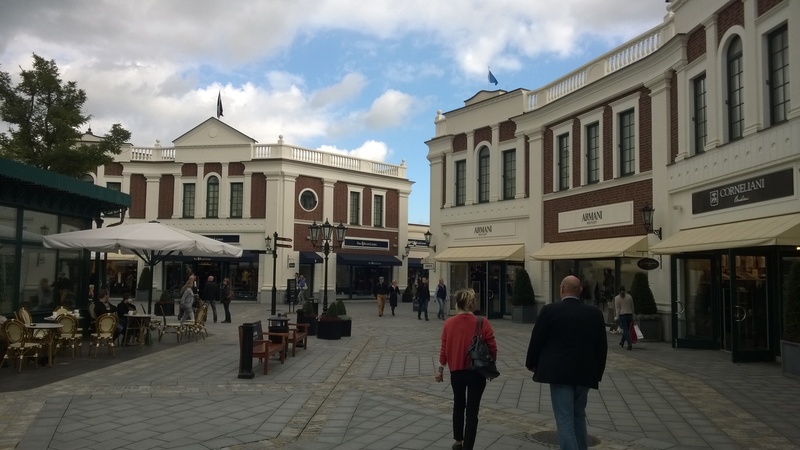 Outlet Center here in my hometown, so low prices compared to Finland! The food…food is really something which can’t be really labeled as good or bad as it clearly depends on the person. In our case it depends entirely on me as my wife doesn’t like Finnish nor German food. In my opinion Germany got the better food and much more variety than Finland. As I said, it depends on the person and I grew up in Germany so all my thoughts about this topic are biased and thus useless for this list. I can’t even think about too many Finnish dishes except of some of the standards in Finland such as Karelian Pasty and some rye bread which I really enjoyed . However what I certainly loved in Finland are the sweets / the love for black liquorice candy and even food and drinks with wood tar flavor! In Germany there is just too much to choose from and I don’t even know where to start as each region or even town has their special dishes so in the end I just say Germany is the winner though I know there will be now an outcry from every Finnish person in the world (thankfully not too many Finnish people out there). The mentality of the people is something really interesting. Most people from around the world have the general idea that Germans are very cold people and don’t show much emotions. Well…don’t go to Finland then as you might think the people are emotionally dead. Sometime ago there was a great satirical blog post on the Helsingin Sanomat (the national newspaper in Finland) about Finnish men called “Tis is Finland Män”. Of course everything exaggerated in that article but in its core it is a perfect description about the people in Finland and their mentality. 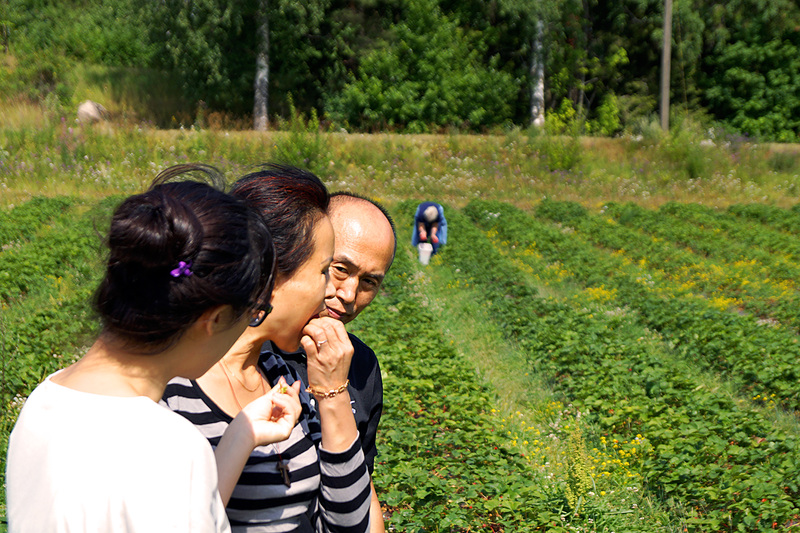 Here in Germany we met some people who lived all their life in other countries such as China and USA. So when they told us about what they think about German people and how unfriendly they all are we were just shocked. For us it felt like we were suddenly surrounded by friendly open-minded people who all seem to care about you unlike in Finland where the general view is “Not shou emousshiöns.” Even my crazy Chinese mother-in-law who doesn’t speak any Finnish or German said after short time in Germany that the people here are so much more friendly than in Finland, not a good sign Finland! These are just the main points I like to compare as I don’t want to go into politics or similar topics as they are for many dead boring or not interesting for us/ me. In general I can say that we prefer living in Germany right now but who knows, it might change in some years again. There is only one point both countries have in common and fail miserable at: Keeping MIL out! 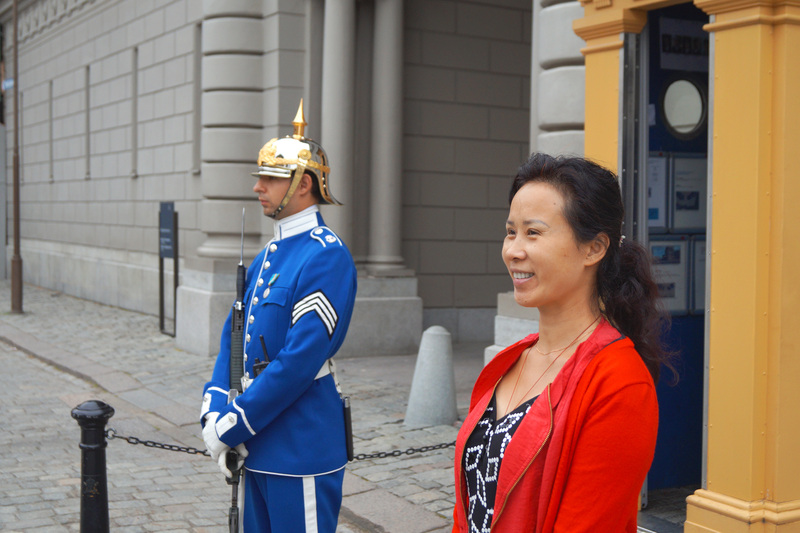 Not even the Swedish Royal Guard was enough to keep MIL out of Sweden! Have you lived in different countries and did also such evaluation on what country you prefer the most? Oh yeah the humor! Gotta to love Finnish comedy such as Kummeli or Uuno Turhapuro! So are the Finnish as law-abiding as the Germans? I could not get over the subway “honor system” when I visited Dusseldorf, nor the fact that everyone on the autobahn abides by the “faster cars ONLY in the left lane.” It was amazing. I think you’d better take Nathan back to Finland once he starts school, though. Finland is supposed to have the best school system in the world — comparable scores to all the Asian schools, without the insane hours of studying. No but seriously, they are insane there. In those countries I haven’t seen a single car without scratches and dents as they even push each other’s cars while trying to squeeze into tiny parking spots! Never knew people in Finland were much more cold compared to people in Germany. Maybe they like their privacy and don’t want to get into anyone’s business. I’ve lived in Australia, Malaysia and Singapore and it is hard to say which place I like best. All countries are unique in their own way. But I have to say things in Australia are very expensive and you can get the same thing for about a third of the price lower in Asia for things like clothes and food. I don’t like liquorice one bit. Just, no.. It is not even about privacy in Finland. It is just a weird thing there and they say also about Finnish men something like “give a Finnish man a beer and he will tell you his life story”…. And no matter where you live, putting away money for things like travel and property is challenging. It depends on where you want to work. If you want to work in retail and have the looks and speak well, then that’s quite easy. But if you’re after a job that pays decently in the government or the education industry which I’m after, it is extremely competitive. I do aim to put away money each month but, still I really am just getting by. Getting good government jobs or positions in the educational sector don’t pay good at all, at least in Europe only when you reach some higher positions through having at least a master degree you might earn okayish after a decade or so. That’s why I went from the beginning into corporate strategies and online marketing and branding but right now I am myself out of everything due to my bad health. It’s the opposite here in Australia. Higher education sector here pays well, but you need a degree to get into this industry. Masters helps a lot too. Certainly you need a degree here as well for this sector however compared to other sectors you get much much less with the same educational level. My partner found your comparison of character/cultural behavourial ticks between Germans and Finns quite interesting. I actually see some similarities among Chinese from China and Germans from Germany. (Don’t mix in North American born….that’s quite different.) Leaning towards technicalities, drive to be perfect, good, nose to the grindstone work ethic, etc. I like fennel bulb..which is a lovely licorice natural flavour. And anise is nice also….but that sounds more French than Finnish..
At a Christmas party last year, one of my brothers-in-law (who is not Asian), brought along cut fresh fennel as a raw veggie. It barely got touched with over 20 family members at this party. I’ve always wanted to go to Germany (and I heard Berlin is very affordable for a big city), but I’m not very familiar with Finland. The nature sounds good. I had no idea the Finnish have a reputation for being so cold! Indeed it is rather sad that my wife doesnt enjoy any western food. She misses a lot in her life due to it! I really enjoyed this post. I miss Finland everyday, especially the nature and the sauna culture. Nature probably the most. And maybe the excellent public transportation as well. And how clean everything is. Okay, I miss many things about Finland. But Finland and Poland are not similar economically and even culturally, and therefore there are many differences. But I prefer other things here in Poland: like the food choice, the beers, the friendly people and the insanely cheap (compared to Finland) living costs, although the salaries are also much lower.. I think I would really like to live in Germany as I have heard/read/experienced that it’s much cheaper than Finland with similar income levels. And Germany has very good flight connections to the entire world, and almost every artist/band tours Germany, so it’s enviable 😀 The only thing that doesn’t really attract me to Germany is the German language, it doesn’t sound very nice or easy to me, hehe.. Yes, Germany got good flight connections to reach pretty much any place in the world but so did FInland as well (especially the shortest flight route to Asia). Very interesting Timo! I always think the German reputation is funny because I’ve met a lot of young German’s who are travelling and they are always super friendly! Maybe it’s a generational thing! That is really crazy about the prices and how much cheaper it is in Germany! I don’t think I would have expected it to be so different. When I was a kid, the stereotype of Germans (by the British) was always that they would lay their beach towels out at 6am to steal all the loungers round the swimming pool (at hotels) haha! I wonder if people still think that? I wonder what stereotype of Britons was and is? Maybe that everyone drinks too much? Haha, yeah even in Germany they make fun of the Germans “reserving” their spots by the pool each morning. That is a really great stereotype and so true especially towards the middle aged and older generation. I agree with you regarding the food, access to nature and the attitude of the people in Finland. I understand German food is heavy in N. Germany. I have never been there. 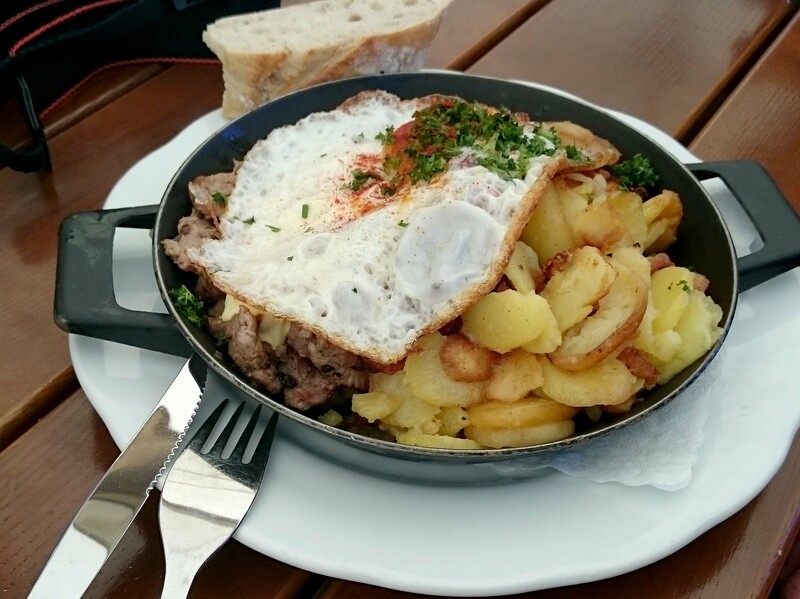 The German food in Munich is nice and much lighter. However, the best German food I had was in Salzberg; the service was exceptional (better than London), the food was very good but the portions were small and expansive. I am now in Kebabland, lol but there are kebab and there are kebab. There are some fish restaurants. One of them has consistently churns out quality food but the service can fall short of the traditional Turkish hospitality. Cups and cups of strong, free Turkish tea, not quite endless cups are the ubiquitous trade mark of traditional Turkish hospitality. This can still be found in eateries . When I went to Finland I only ate reindeer, salmon and potatoes every day. I was told there was nothing else, haha (it was winter). I read the article about the Finnish man, it was hard but funny, hahaha. Wow quite a fascinating comparison between the two countries. 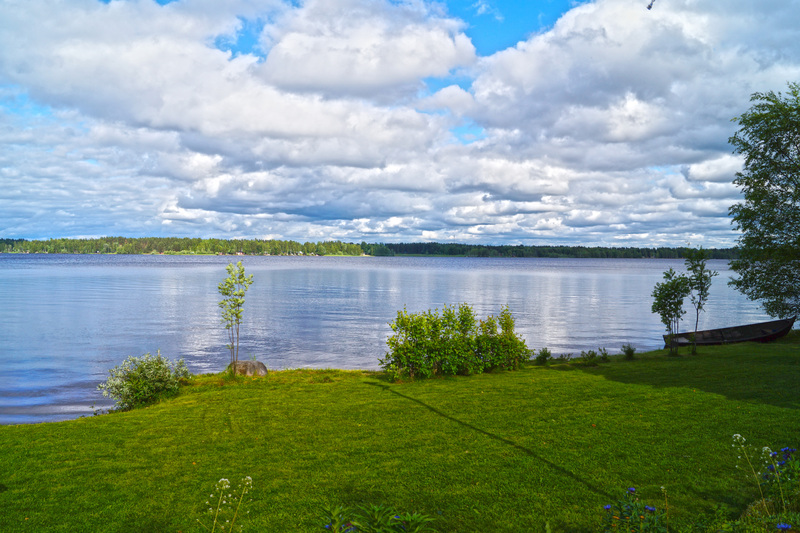 It is nice to know that Finland has astounding nature in the cities! Not something you see very often.